Classically designed and featuring a subdued pallet of golden brown and blue, this antique Khorassan carpet encapsulates the beauty of traditional Persian rug design. 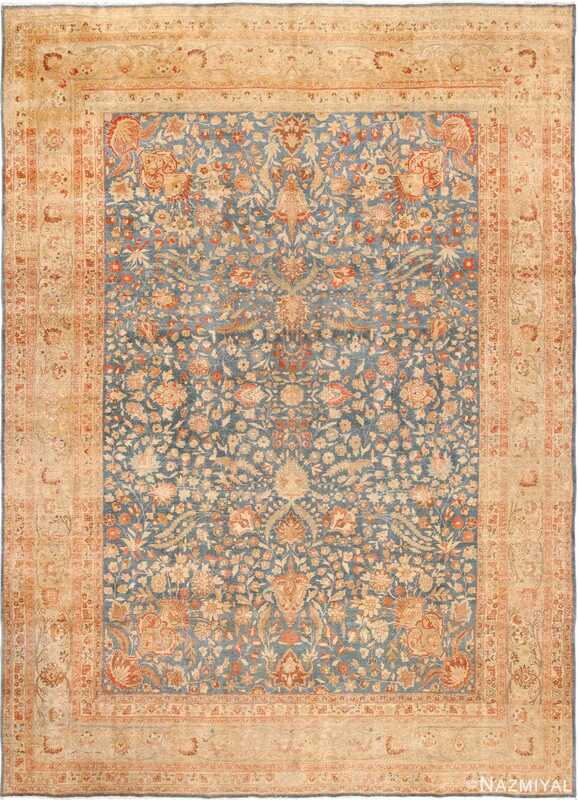 Beautiful and Decorative Antique Persian Khorassan Carpet, Country of Origin: Persia, Circa Date: First Quarter of the 20th Century - An antique Oriental rug that was classically designed and featuring a subdued pallet of golden brown and blue. 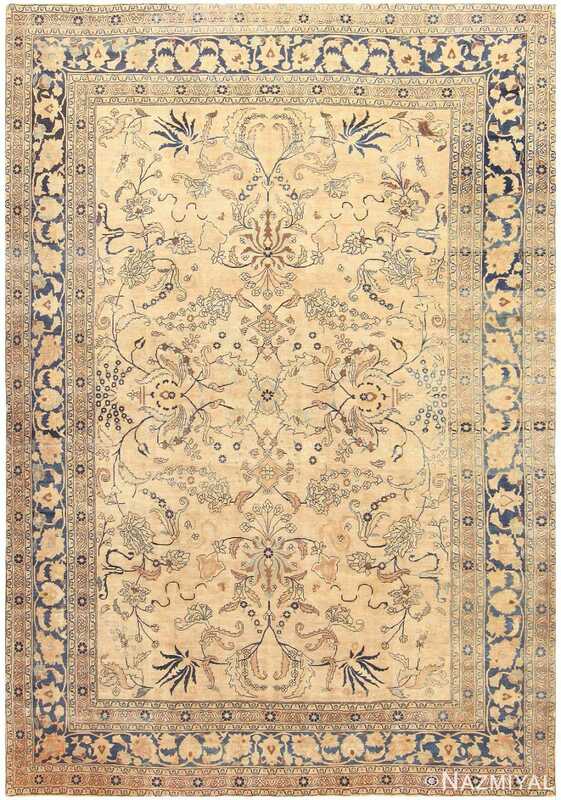 This antique Khorassan carpet encapsulates the beauty of traditional Persian rug design. 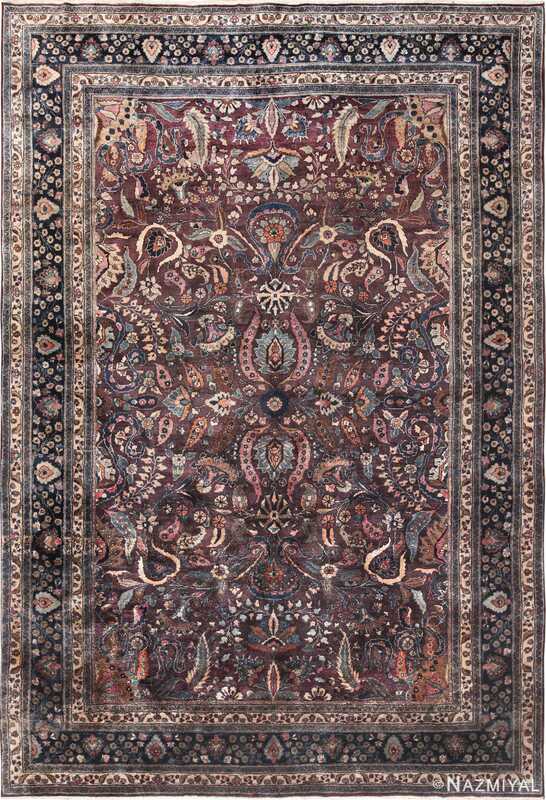 An intricate series of borders runs along the perimeter of the antique Persian Khorassan carpet, richly decorated and complex. A series of three narrow borders comes first, decorated with flowing vine scrolls and lovely floral details. A matching set appears opposite this border, across a large, single band of deep blue, decorated with soft golden-brown vine scrolls. This elaborate confluence of classically designed borders frame the rest of the carpet remarkably well: for within, the large field is characterized primarily by a conspicuous amount of open space. While there is a good deal of rich detail throughout the field, it is spaced quite far apart, leaving wide tracts of simple negative space. Between the graceful vine scrolls and truly magnificent floral elements that dance throughout the field, large swaths of undecorated golden-brown add depth and context to the remainder of the composition. 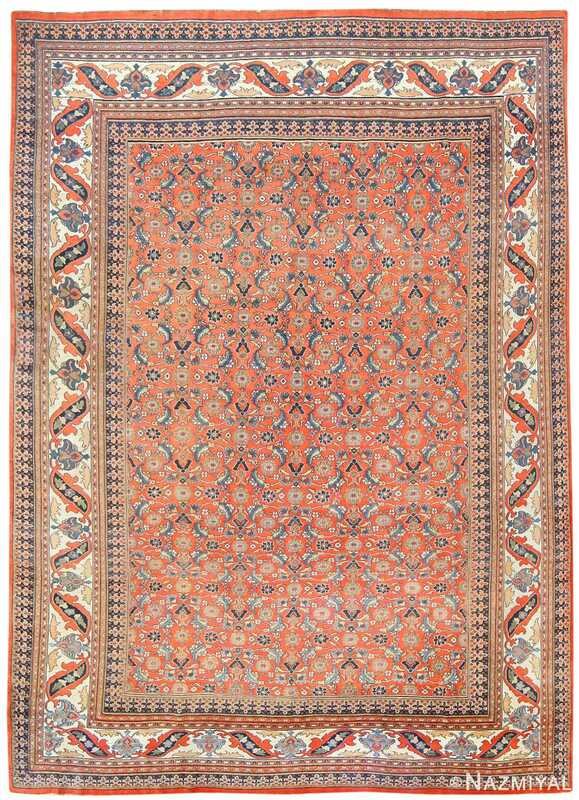 A beautifully designed and compelling piece, this antique Khorssan carpet from Persia is a truly excellent example.